Brian Milakovsky lives in eastern Ukraine where he works on post-conflict economic recovery. He has worked on ecological and humanitarian issues in Ukraine and Russia since 2009. The enormous Azot chemical plant looms on the outskirts of Severodonetsk, a factory town of 110,000 in eastern Ukraine. Severodonetsk became the new capital of Luhansk oblast after the region’s namesake was occupied by separatist and Russian forces in May 2014. At its peak Azot (which means nitrogen in Russian) was one of the largest producers of chemical fertilisers in the Soviet Union. The Russian-financed Ukrainian oligarch Dmytro Firtash bought the privatised plant in 2011 and incorporated it into his Ostchem holding, which unites Ukraine’s four largest fertiliser factories in a near-monopoly. Firtash’s business empire controlled imports of Russian natural gas, allowing him to make solid profits in the chemical industry where gas makes up 70% of production costs. Although it had steadily been losing market share to more efficient competitors in Europe, Russia and China, the Azot factory still employed 8,000 people when separatist forces took over Severodonetsk in 2014. The factory was idled after heavy fighting knocked out Luhansk Oblast’s connection to the national electricity grid, which left the region an energy island wholly dependent on a single aging and war-damaged power plant. Until the region is reconnected to Ukraine’s national grid, Azot and other large factories can only operate at a fraction of their potential. But the main problem is geopolitics. Russian economic warfare on Ukraine has meant the end of cheap gas, putting in question the economic viability of Ukrainian fertiliser production and the 40,000 jobs associated with it. Ukraine’s new leaders announced the start of “de-oligarchization” and the United States sought Dmytro Firtash’s extradition from Vienna on bribery charges. I have been living in Severodonetsk for two and a half years. I know well the anxious glances at the idle factory that fills the horizon at the end of Chemists’ Boulevard. Taxi drivers mutter darkly that “soon they’ll cut up our Azot for scrap metal.” The economic future of this city, Ukraine’s outpost just 30 kilometers from the unrecognised “Luhansk People’s Republic”, is hanging under a dark cloud. In these crisis conditions, Ukraine’s chemical industry finds itself pitted against the current engine of economic recovery, the agricultural sector. This dispute scrambles familiar perceptions of Ukrainian politics. Farming interests from Ukraine’s patriotic heartland call for lowering import tariffs on fertilisers to counter Firtash’s monopoly and boost crop yields, even if that means letting in huge imports from the country occupying half of the Donbas. Meanwhile, the Opposition Bloc, descendent of Viktor Yanukovich’s pro-Russian Party of Regions and recipient of support from Firtash, rails against lowering tariffs on Russia as “treason and complicity in terrorism”. But proponents of protectionism extend well beyond the oligarch’s political allies. Volodymyr Vlasyuk of Ukrainian Industry Expertise, a respected economic analyst, told me that that Russia has long subsidised its chemical fertiliser industry with gas at discounts up to 40% and practices dumping in Ukraine. Vlasyuk calls for steep tariffs. Within the ruling parliamentary coalition there are proponents of both sides, and state policy tends to lurch chaotically between these competing interests. In 2015, the Ukrainian government lowered tariffs on Russian fertilisers, and for the first time since independence Ukraine became a net importer of fertiliser. Certain grades of fertiliser were supplied almost exclusively by Russia. But in 2016, the pendulum swung back and steep anti-dumping tariffs were imposed – Severodonetsk Azot briefly puffed to life. However, at the very start of the fertiliser buying season in 2017 the government abruptly lowered tariffs on Russian imports, citing “threats to Ukrainian national interests and the harvest.” Almost simultaneously, the state natural gas company shut off supplies to Firtash’s factories, citing unpaid debts. Domestic production crashed, and many experts wondered if this was not a coordinated political move against the Russian-financed oligarch. But in the resulting crisis, Ukraine lost out in almost every possible way. Russian producers massively increased shipments to Ukraine, raising prices and bringing home windfall profits. But even these imports could not make up for domestic production, and thousands of farmers simply didn’t fertilise their fields. This caused crop reductions in the scale of five million tonnes of grain or by one expert estimate up to 32 billion hryvnias ($1.1 billion) in value. Meanwhile, Ostchem had already taken in tens of millions of dollars of pre-orders from farmers, which it mostly has not paid back. After this fiasco, Ukraine’s prime minister Volodymyr Groysman assembled a task force of agricultural and chemical industry stakeholders to hash out a compromise on tariffs. It gridlocked, and in the run-up to the 2018 planting season all but one of Ostchem’s factories are idle. Farmers made huge pre-orders of Russian fertiliser, and experts predict that more than half of the country’s fertiliser will come from abroad. And so the political jockeying activated again. Throughout March, Groysman’s government has vacillated between zeroing out of tariffs on Russian fertilizer and a full ban on their import. Finally, he chose the latter, imposing a temporary moratorium on Russian imports while tariffs were raised above 40%. His goal was “restarting every fertilizer plant in Ukraine,” the prime minister said. A sustainable balance between agricultural and industrial interests continues to elude Kyiv. Farming associations howled predictably while industry experts predicted the re-starting of Ostchem’s plants. But in Severodonetsk waking up the aging industrial giant could prove a challenge. When this article went to press, the factory’s power had been shut off for $3.4m of unpaid energy bills, and there were doubts that the huge ammonium reservoir could be sufficiently cooled (! ), raising ominous warnings of a “Chernobyl style” accident on the 32nd anniversary of the nuclear disaster. When I asked out the crisis in the Ukrainian chemical industry could be resolved I heard similar proposals from multiple sources. Valeriy Chernish, the head of the Severodonetsk Azot labour union, industrial analyst Volodymyr Vlasyuk and chemical trader Alexey Malevanets all believe that tariffs are important, but what is really needed is cheaper natural gas. The chances of restoring Russian supplies at profitable rates are vanishingly small, so this gas must come from domestic sources. 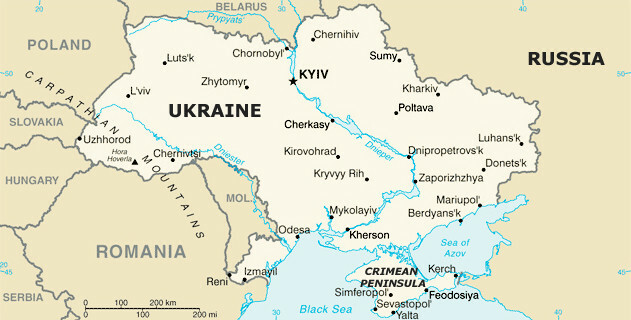 Despite its famous reliance on imports from Russia, Ukraine sits on Europe’s third largest natural gas reserves. Kyiv has made increasing domestic natural gas production a policy priority. Chernish calls on the state firm Naftogaz to provide rebated gas to Ukrainian fertiliser producers, as Yulia Tymoshenko’s government did during the devastating 2008 global economic crisis. “That was the only way that our factory survived,” Chernish told me. According to Vlasyuk, the price that Naftogaz charges for 1000 m3 of gas (up to $380 including VAT) is inflated. The production cost of extracting that volume from domestic wells is around $50, but the sales price is brought up to the cost of imported gas with a large mark-up to boot. Such a pricing scheme pulls in big revenues for Naftogaz, but should maximising profits be the goal of a state company whose product is crucial for the functioning of Ukraine’s industrial economy? Naftogaz’s director Andriy Kobolev dismisses subsidisation schemes for domestic factories as being anti-market. Just look at the fiasco in 2017, Kobolev suggests, when Firtash charged high prices for pre-payments but couldn’t pay his gas bill. Furthermore, a recent Atlantic Center blog accused Firtash of using his political influence to block transparency reforms in Ukraine’s gas distribution sector, allowing his remaining energy companies to misdirect millions of dollars from World Bank and IMF loans meant to help Ukraine meet its energy needs. If these accusations are true, Groysman may find it too politically risky to offer Firtash a further subsidy in the form of rebated gas. As the liberal parliamentarian Serhiy Leschenko points out, the oligarch would likely use the resulting savings to pay back his huge debts to Russian banks. Struggling factories like Severodonetsk Azot might never see the modernisation needed to restore their competitiveness. Firtash is a dangerous figure for Ukraine’s political elite. According to political scientist Andrey Buzarov, Firtash remotely controls a faction of the Opposition Bloc that pushes for a confrontational relationship with the ruling coalition. He has given interviews to the European press about the need to federalise Ukraine, showing that he has not reconciled himself with the current arrangement of power in the country. No Ukrainian citizen is happy that oligarchs like Firtash control so much of their country’s economic resources, Alexey Malevanets told me. “But if striking at him helps Putin, is that better? When our factories aren’t working and we import fertiliser from Russia, every ton of grain we grow is subsidising their economy instead of ours”. Vlasyuk adds that Ukraine is drifting into a dangerously unbalanced economic model, when it imports value-added products like fertiliser or farm equipment in order to boost exports of raw grains. This is a recipe for becoming someone else’s resource colony, he warns. According to Serhiy Ruban, who manages one of the country’s largest fertiliser distributors, Ukraine would do well to study the experience of the European Union. Its members offer some protection and subsidies to domestic producers in order to ensure national food security and employment. But they also create conditions for competitive import to prevent domestic monopoly. In his opinion, the best means to address Firtash’s inordinate market power is not cutting off gas to his factories, but in seeing through an anti-monopoly case opened against his holding in 2017. As long as the majority of the country’s chemical fertiliser sector is held in an oligarchic monopoly, it is unlikely Ukraine’s leaders will find the political will to address the fundamental issue (gas), preferring the quick fix of raising tariffs. What’s next for the city of chemists? The fate of the chemical industry has consequences at a national scale. But the question is particularly poignant in Severodonetsk, the “city of chemists”. Labour union leader Valeriy Chernish sadly described how the factory has hemorrhaged several thousand workers over the past three years: “After the spring shutdown in 2017, they were leaving 50 a day.” The first to go are the most qualified and experienced engineers, snapped up by chemical plants in Algeria, Kazakhstan and, most of all, Russia. “Now they’re developing someone else’s economy,” Chernish said. Many less qualified workers have joined the massive labour migration to construction sites in Moscow or assembly lines and strawberry fields in Poland. Other industrial giants in government-controlled Luhansk oblast are lying prostrate as well. In neighbouring Lysychansk, the massive Linik oil refinery is idled because its co-owner, the Russian state oil company Rosneft, shut off the flow of crude. The Lysychansk Coal Company, saddled with low-productivity mines, is living on government subsidies and steadily shedding its last 5,000 workers. Smaller factories in the region are showing more resilience but can only employ a fraction of the workforce of the troubled enterprises. But the industrial depression is even worse in the unrecognised “Luhansk People’s Republic” just 30km away, where war damage, marauding, blockade and economic mismanagement have shut down dozens of factories and mines. The economic situation in the government-controlled territories looks better in comparison, but this is damningly faint praise. Kyiv wants the government-controlled half of the Donbas to serve as a socio-economic showcase that will convince residents of the separatist republics that their future is with Ukraine. But Severodonetsk cannot play such a role and stem its outflow of labour migrants without help from Kyiv to resolve the structural issues undermining its economy and traditional chemical industry. No one factory town can address these problems alone – it must be part of a comprehensive industrial strategy. Until Ukraine develops one, it is dangerously adrift.